The Madden NFL-inspired Pecover Vs. EA federal class-action antitrust lawsuit picks up steam, as law firm Hagens Berman notifies class members they have until June 25 to be excluded from a potential payday. Considering the eligibility requirements to be a class member in the Pecover Vs. EA lawsuit, we're likely looking at a pretty large group of people. 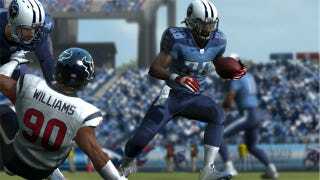 According to Hagens Berman, anyone that's purchased a Madden NFL, NCAA Football, or Arena Football League game since January 1, 2005 is eligible to participate in the suit, which alleges that EA's exclusive deals with these various organizations have resulted in customers being overcharged for said games. Mobile versions, used copies, and games purchased directly through Electronic Arts don't count. The lawsuit was originally filed in 2008, popping in and out of view over the past few years as both sides jumped through the court systems' various and often fiery hoops. The latest notice, sent to us by multiple readers, is a notice of class certification, letting those involved know that the final line-up is being formed.. Those that would rather opt out of the lawsuit can do so via written letter or electronically before June 25, 2011. Those wishing to sign themselves up can still do so via Hagen Berman's convenient sign-up form. Is there a chance you'll make a ton of money doing so? Probably not. Even if there is a huge settlement, it'll be hugely diluted, with up to 25 percent going towards legal fees and the remaining amount divided up amongst a rather large group of individuals. But even if EA comes out of this clean, it doesn't hurt to be on a large official list of people unhappy with a major game publisher's practices. I smell coupons!